Making pottage was the simplest form of cooking and provided at least a reasonable meal for peasants in 12th century England. Recipes for pottage essentially called for vegetables and stock to be cooked in an earthenware pot or cast-iron cauldron. This is of course is the forerunner to soup making as we know it today. Cooking pottage was an everyday activity for most people in medieval England. In their meagre homes the average peasant would cook in an earthenware pot amongst the hot ashes beside their fire in the down-hearth. If their hut had a beam stretched across it, they had the option of hanging a cauldron (usually a cast-iron one) from it over the fire like the one in the photograph. Here is a video of a fireplace with a cauldron over it at the castle of St. Mesmin in the Vendée area of France. The pottage mixture was brought to the boil, simmered and stirred occasionally with a ladle or wooden stick called a spartle. 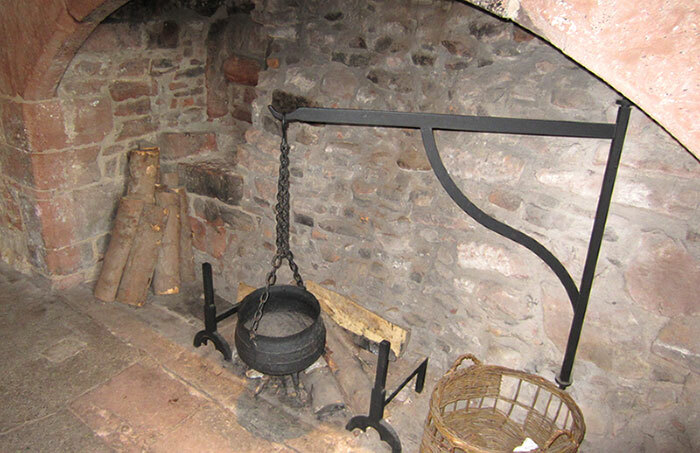 In the kitchens of grand medieval castles of course cauldrons were commonplace and much in evidence around the great fireplace. A pottage recipe would vary depending upon the vegetables and meat available at the time. As our introductory page on pottage explains, peasants tended to be able to make only thin pottage with the thicker and more tasty pottages (frumenty and morrews) being enjoyed by the wealthy. Vegetables – the most common ingredients for pottage making. These included cabbage, onions, leeks, celery, garden peas. Here is an easy cabbage pottage recipe you can try. We think it’s simply delicious and feature it regular on our menu at home! Herbs – for the average peasant, extra flavouring for the pottage came from fresh herbs such as parsley, sage, thyme and rosemary. Spices – these were an extra source of flavouring but as they had to be imported, they were expensive and usually only affordable by the rich. 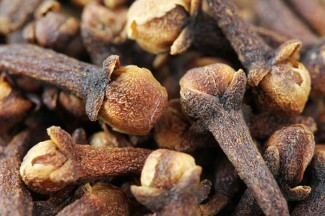 The most common spices used in pottage included cloves, nutmeg and cinnamon. Saffron strands were sometimes used to add colour and an extra exotic flavour saffron was the most expensive of all spices imported.